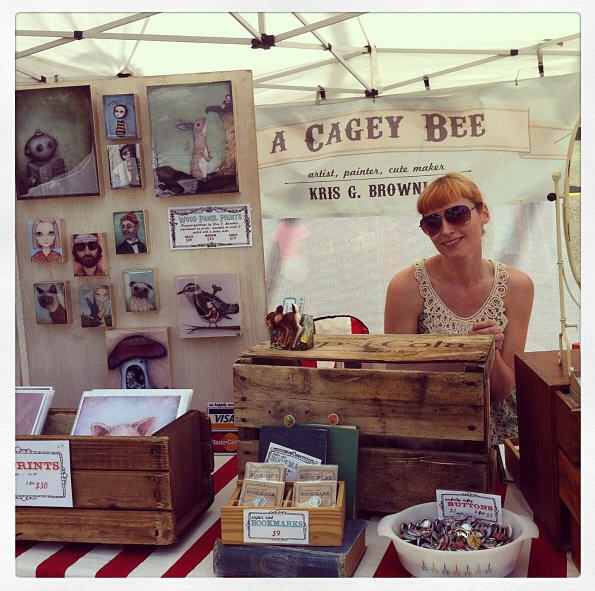 The summer market season is ramping up, which means you’ll be seeing a lot of Cagey cuteness around Vancouver over the next couple of months. Car Free Festival on Main Street was a blast with thousands of people coming out to enjoy the sunshine. I got lots of doggy visitors by my tent, which always makes the day more fun. I’m sure some people think my mister (A Cagey Beard) & I are nuts the way we drop everything to make sure the other one sees a wiggly pug puppy coming down the block. We’re talking PUG PUPPY here. With that puppy smell! What could be more important than that??? The next two weekends you can find me at the Vancouver farmers markets – Trout Lake on Saturday, June 22nd & Kitsilano farmers market on Sundays (June 23 & 30th). Then it’s back to Granville Island for the first week of July. Phew! Guess I’d better get to work making new stuff! At some point this summer I also need to book a holiday. I’m thinking…relaxing, water warm enough to swim in, cold beer & nights listening to my mister play guitar. I don’t want to spend too much time traveling, so somewhere within a few hours of Vancouver would be great. The good & bad part of that is – the choices are overwhelming! Do you have a favorite holiday spot near Vancouver? Let me know in the comments below!